Introduction: This analysis is part 2 of 2 that seeks to conclude in a detailed trend forecast for UK house prices that extends my existing forecast into Mid 2014 to the end of 2018, thus a 5 year forecast for UK house prices 2014-2018. This analysis is focused on the impact of the Inflation mega-trend on the prospects for UK house prices that concludes in a detailed trend forecast and its implications for outcome of the next general election. The latest inflation data shows CPI falling to 2.1% for November 2013 (RPI 2.6%, Real inflation 3.6%) which was received as good news as inflation was finally starting to home in on the Bank of England's 2% CPI target rate. This prompted the usual mantra amongst the academics of the risks of dis-inflation and in some cases even deflation which were coupled with benign inflation forecasts by government institutions such as the Bank of England and the OBR that repeated their forecast that UK inflation would resolve to 2% in 2years time that is always the case and I mean ALWAYS, for more than a decade now the Bank of England has been spouting the same mantra aimed at keeping the wage slaves sedated as the actual inflation graph below illustrates that in reality there is an over 90% probability for UK Inflation being significantly above 2% in 2 years time. If you have been reading my inflation mega-trend series of articles this year, then you would know that I would not be surprised if UK inflation reaches as high as 7% in 2 years time! Which is well beyond anything in the collective consciousness of what passes for economic analysis from within ivory towers such as the OBR and a litany of economic Thick Tanks. 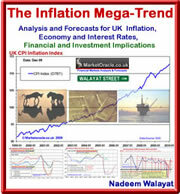 However, the inflation truth is far removed from that which the media focuses upon with the annual percentage rates of inflation that masks the truth of what is an exponential inflation mega-trend which is the primary consequences of perpetual money and debt printing monetization programmes that the government is engaged in, in an attempt to buy votes through high deficit spending, an inflation trend that asset prices are leveraged to and oscillate around which currently has UK inflation compounding at the rate of 2.1% per year that resolves in the following exponential trend. The debt / money printing induced inflation mega-trend is forcing people to either spend or put their hard earned cash into the bankrupt banks for a pittance in interest that is TAXED, so that it is near impossible to consistently get a return that is greater than even the official rate of inflation let alone the real rate of inflation that is currently about 3.6%, as governments continuously tinker with the methodology to reduce the official inflation rate as you will likely experience when you go to do you weekly shops and experience inflation rates nearer to 9% then 2%. The below table for the cash isa rates as offered by the Halifax shows that savings interest rates crashed directly in response to the Bank of England's Funding for Lending Scheme announced in July 2012, which sought to provide the Banks with cheap money to encourage lending to the general public that originally would total an estimated £80 billion over 18 months but which subsequently was indefinitely extended. The effect of which has been for the Banks to rely on Bank of England / UK Treasury for funding of lending instead of savings and thus savings interest rates continue to crash despite a strengthening economy. Just take a second look at this table at the degree of erosion of purchasing power from savers, even the long 5 year Halifax fix fails to match RPI of 2.6%, instead the rate paid is a pittance of 2.1% when it should be at least 4.5%! This is systemic banking system wide! This is why the banking system operates as a crime syndicate to systematically STEAL money from their customers be it LIBOR, PPI, SWAPS or PURCHASING POWER as a consequence of far sub inflation interest rates. Furthermore, the Bank of England's recent announcement that it would restrict use of funding for lending to target businesses instead of mortgages has instead of increasing savings interest rates that the mainstream press ran with as the consequences of, instead has to date had the opposite effect of resulting in further cuts in the rates of interest. Again, the consequences of the exponential inflation mega-trend stealth theft of savers wealth is worsened by the 20%-40% additional theft by means of double taxation on savings interest that ISA's at least attempt to protect against i.e. Inflation steals the value of your savings by currently about 1.5% then the government taxes you by 20% to 40% on the sub inflation interest rate that you will be in receipt of which means that savers are guaranteed to lose 2% of the value of savings per year which the following graph illustrates that over the past 5 years for the top 20% interest paying instant access accounts, on the CPI + tax measure over 8% has been stolen and on the real Inflation measure over 16% has been stolen. To protect oneself from the global inflation war against savings, savers need to risks i.e. if you invest in the stock market then you need to appreciate the fact that it will be far higher risk than leaving it in the bank even if it WILL lose its value at approx 2% per annum even in the best instant access savings account. For much of 2012 and for the whole of 2013 I have been flagging that the UK housing market presents one of the best opportunities for not only protecting against the stealth inflation bankster and government theft but also by profiting from the inflation mega-trend. a. The housing market is nowhere near reaching another boom phase which only coincides when house prices pass their previous peak in REAL terms i.e. after inflation, this suggests that any upward trend in house prices is going to be shallow where the next boom could be as long as a decade away. b. That the housing market in real terms has barely lifted off of its March low and is thus highly susceptible to a prolonged period of stagnation in real terms, i.e. the housing market basically goes nowhere for several years in real terms. c. That it is highly likely that we have yet to see the low in UK house prices in real terms, which either means a sustained period of inflation or that the UK house prices revisit there 2009 March Bear market lows. This analysis suggests that the value of UK house prices will continue to be eroded in real terms as a consequences of high inflation and weak nominal house prices trends which implies several years of stagnation to be followed by several more years of weak house prices growth in real terms. Thus those looking for a return to the boom times over the next few years are likely to be disappointed, especially the buy to let brigade that rely on capital appreciation in real terms to generate investment returns after costs. The updated graph shows how things panned out in terms of a housing market bottom and what that bottom now implies for house prices for the remainder of this decade. 1. The forecast real terms trend trajectory of June 2010 proved remarkably accurate in terms of mapping out where UK house prices would likely bottom several years later both in terms of price and time. Thus this indicator will again play a pivotal role in the extension for my existing forecast. 2. This supports my long standing view that the UK housing bull market can be sustained for the WHOLE of the remainder of this decade (6 years) and probably beyond. 3. That my existing expectations for a 10% per annum trend trajectory is more than sustainable, in fact the average rise in UK house prices over the next 6 years could easily exceed 80%! Which translates into an average of over 13% per annum that is well beyond anything that most housing market commentators, academic economists and journalists who think they are economists can comprehend today. This articles concluding trend forecast also includes implications of analysis of population growth, house building, unemployment, wages, mortgage debt and affordability that have been left out of this article but are contained within the new UK Housing Market Ebook (Free download from Mid Jan 2014) i.e. the below graph illustrates continuing out of control immigration. The trend trajectory continues to home in on my forecast expectations for UK house prices to be rising at a rate of more than 12% per annum for January 2014 data, and then average a rate of 10% per annum. In formulating a trend forecast for UK house prices beyond my existing forecast expectations into Mid 2014 and for several years beyond of 10% per annum, I need to weigh up the influences of disparate drivers where on the positive side we have momentum, sentiment and a strong sustainable economic recovery that will last for many years whilst on the negative side we have a economy that continues to accrue a mountain of debt that seeks to delay the day of reckoning my means of the INFLATION, which is both a positive in times of inflating prices and a negative in terms of eroding purchasing power of earnings and affordability which is why many ask how can house prices rise when property is unaffordable for so many house hunters, and it is true that house prices today are nowhere near the affordability levels of the mid 1990's bottom, in fact today's house prices in terms of affordability are beyond the early 1990's peak! Also that high inflation also carries the risk of the Bank of England panicking to prevent a wage price spiral. Though I expect wages will continue to be depressed in real terms as a consequence of continuing high immigration from eastern europe (20 times the rate the politicians propagandised that it would be), the benefits culture catastrophe that fuels deficit spending and the convergence of GDP per capita between East and West. So this housing bull market is NOT going to be a re-run of the last bull market! 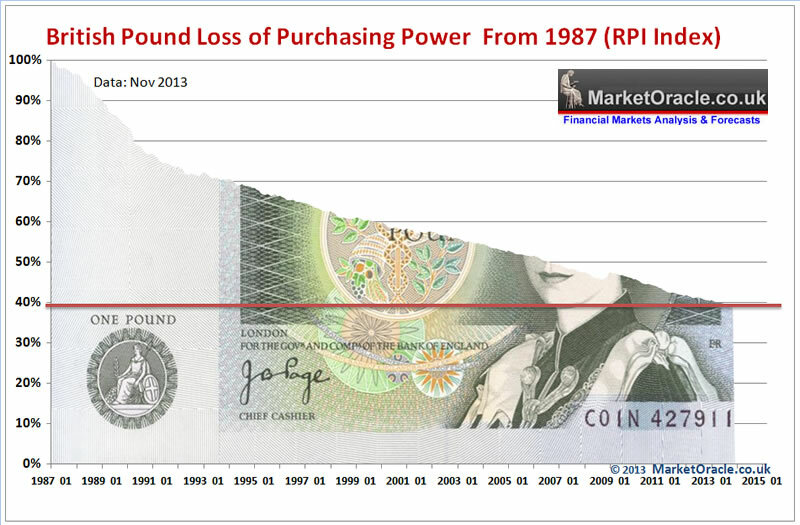 We are not going to see anywhere near 30% per annum price rises. Instead it looks set to be a far more measured affair that will likely never see a bubble spike before the bull market tops that my opinion could only be replicated during a period of out of control inflation i.e. RPI well above 10% and approaching 20% per annum. So, in term's of generating a multi-year housing market forecast this analysis continues to resolve around a relatively mild oscillation around 10% per annum. Which implies an acceleration into the run up to the next general election followed by a slowdown to a rate well below 10% per annum, that overall suggests that as long a UK inflation as measured by RPI does not persist beyond 5% per annum then UK house prices should target an average rate of 10% per annum for the remainder of this decade (6 years) and therefore target a 60% rise on the current Halifax House prices index into the end of 2019. At present UK house prices are on an accelerating trend trajectory that implies the current momentum of 8.5% will continue to accelerate to a peak of more than 13% by Mid 2014, and likely stay above 10% into the May 2015 election, following which the momentum will likely slow sharply during 2016 which I am sure will prompt much bearish commentary at that time that slowing house prices inflation that could dip below 5% is a sign that the bull market is over when all it will do is lay the grounds for the next surge higher in momentum during 2017 and 2018, though I will leave the run up to the scheduled May 2020 General election for a future UK housing market ebook of some time during 2018. Therefore this analysis is focused on concluding in a detailed 5 year trend forecast into the end of 2018. CBRE - 17% Rise by 2018 - Commercial property consultants (CBRE). OBR - 20% Rise by end of 2018 - The governments think tank (Telegraph). Knight Frank - 24% rise by end of 2018 - A global real estate consultancy (KnightNox). Savills - 25% rise by end of 2018 (up-rated from 18% a few months ago)- LSE listed Estate agent, whilst the most bullish but still playing it safe (Telegraph). The primary risk to the forecast is inflation, whilst I don't expect low inflation to significantly impact the forecast however high inflation as manifested by a a persistent rate of more than 5% per annum will effect the forecast. Given the leveraged nature of house prices to inflation therefore this would roughly translate into the expectation that for every 1% that UK inflation stays above 5% then house prices will rise by an additional 2%. For instance if UK inflation spends several months at 7% then house prices will rise by an additional 4% per year. Though on the downside in terms of house prices, a soaring UK inflation rate will also hasten an END to the housing bull market as the Bank of England will once more panic to prevent a wage price spiral by raising interest rates to MORE than the rate of inflation which would act to seriously erode housing market sentiment towards a sub RPI-inflation annual house price inflation rate. The following graph illustrates the impact of the UK house prices trend on general election results for the past 30 years. The window for an outright labour election victory has already ended as of July 2013.